Anyone else have major food and sugar hangover right now?! It was such a beautiful Easter, and I hope you had one as well! Halleluiah He is Risen! Especially loved seeing Gabriel in a bow tie, and Veronica in a bonnet. I died and went to heaven. P.S. Its the last day to enter to win an Ikat Print from Lona de Anna! 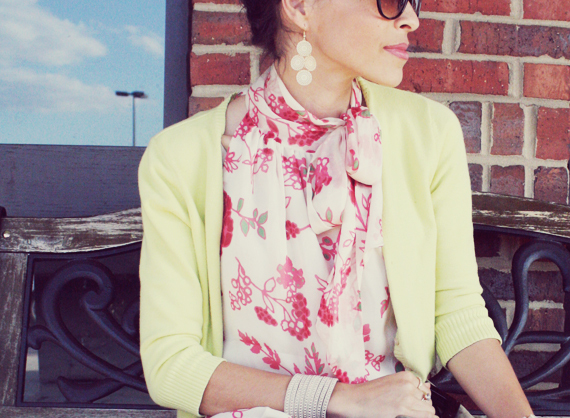 pastels and florals really are the perfect pairing, and i adore your sunnies! Love this outfit! you always look beautiful! and you deserved to indulge after being disciplined to give up sweets!! That top screams spring! I love it and love how you styled it! Yes, I am detoxing with lots of coffee *with lots of Coldstone creamer right now...what a great Easter! I'm having to do the opposite. I've been gorging myself on sweets lately, and I'm trying to cut them out for the next month....I have to be swimsuit ready in 3 weeks for our cruise! I love sweets and our house is swimming in them right now, so I'm doubtful this goal with actually be accomplished! love your yellow cardi! i want one like that!!! totally borrowing ms hepburn's quote from you. love it!! and pastels is def my fav this season! and paired with floral?!. to die for!!! love it!!! I absolutely love this look! The blouse is awesome and I love the colors together. i have to be honest, i LOVE these true beauty files that you do..because you and I have such similar style/taste..so i love seeing what you put together. So retro inspired and such a fantastic look on you Anna. What I love is that blouse. Holy moly that is gorgeous! :) Happy Monday! How prettyyy is that outfit!! This is such a gorgeous look! I love your blouse so, so much. The print is beautiful and I love the high collar. So pretty! what a freaking amazing top!!! I love pastels right now, and I think they look so perfect paired with pretty floral prints. You look so pretty and spring-ready! I'm glad to hear you had a good Easter! You're so gorgeous, girl! Love the outfit! I just love coming to your blog. It's so pretty and refreshing to look at, like a big glass of water after a run refreshing. everything about this outfit is lovely! love those shoes. cheers. i may have eaten too many sweets. my tummy hurt last night. woops! GORGEOUS Anna! Love your looks here. I definetely need such a top! i love the outfit! you look wonderful. i especially love the cardigan. and i am feeling that sugar hangover big time. What a fantastic outfit! You're beautiful. 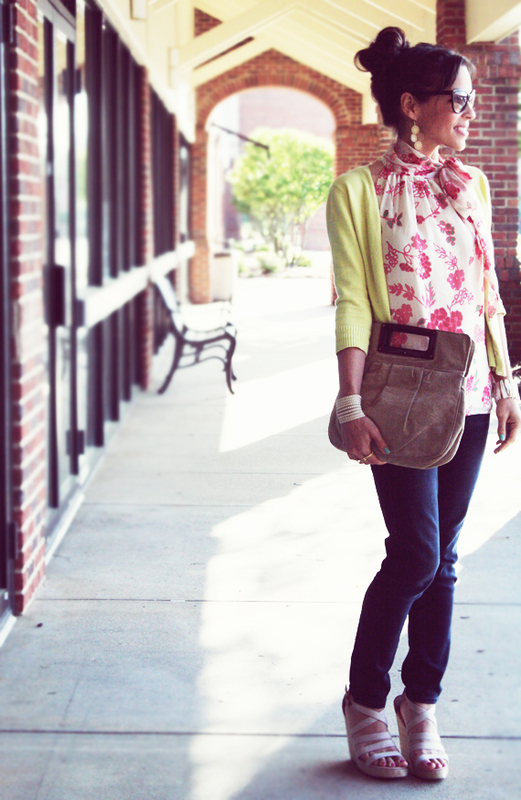 I love the florals with that pastel cardi! The retro look suits you! Super cute look! Love your sunnies and bag! You look so pretty and I love this new hair-do of yours! Very Audrey-esque! Your blouse is beautiful and I like it with the bright cardi! Glad you got your fill of candy after Lent. With all the sugar in the house, I'd say I've over indulged for the last few days! I need to put it in a non-visible spot so I don't tempt myself anymore lol. Lovely floral top! It looks great with the cardigan and jeans. You look very chic! This is really a pretty in pink outfit with a definite 50s/60s sensibility. The soft, warm, pink light really makes these stunning images even sweeter. You should be really proud of these photographs. Thanks, as ever, for the blessed inspiration. I hope your Easter was a really lovely family time and your daughter another blessing and revelation. love this look with pastels en floral, I like your style !